With nearly 9,000 stores worldwide, more than 6,000 of them in the United States alone, serving 2.5 million donuts and 2 million cups of coffee to more than 3 million customers per day, Dunkin’ Donuts is undeniably one of the most prominent guilty pleasures in the world. I favor Starbucks coffee and de-favor eating donuts altogether (despite their awesome deliciousness) so I’m in a minority that doesn’t frequent Dunkin’ Donuts — a minority that has become even smaller since 2002, when a steaming cup of coffee was added to the Dunkin’ Donuts logo to muscle back into consumers’ consciousness that coffee wasn’t just available from Starbucks or McDonald’s. And, apparently, that change paid off as Dunkin’ Donuts is celebrating its 60th anniversary (it was founded in 1950) with a new identity that not only removes the coffee cup but also reaches back to its vintage roots for inspiration. Vintage inspiration for the new identity. New Dunkie by Matt Stevens on the right, along old Dunkie. 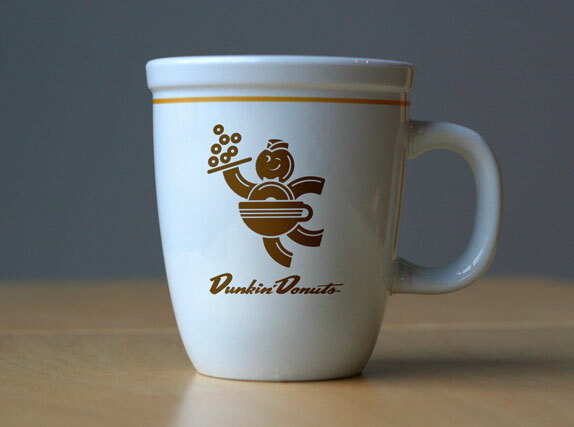 At the center of the new identity is Dunkie, a coffee-cup-and-donut-shaped buddy that served as the brand’s mascot during the late 1950s and ’60s, even inspiring a Mr. Potato Head spin-off, Dunkie Donut Head. 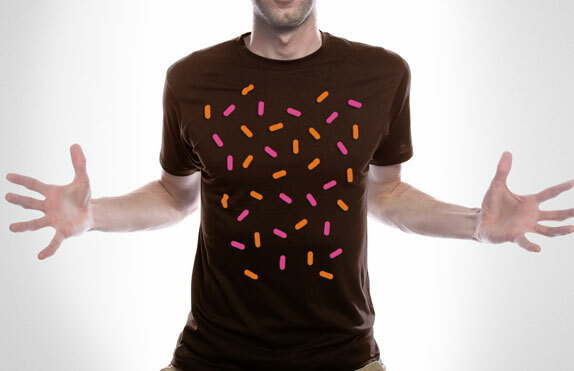 Charlotte, NC based Matt Stevens was approached by the creative director from Dunkin’ Donuts in-house team to revisit Dunkie and prepare him for the twenty-first century. 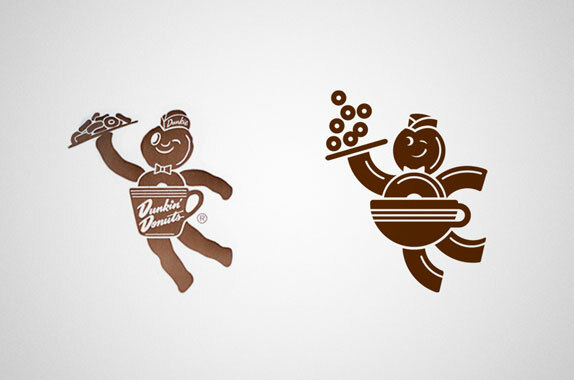 Retaining all the elements from the old Dunkie, new Dunkie is a bold, animated new version eager to serve you fresh donuts and hot coffee as he leaps towards you. More surprising than Dunkie replacing the cup of coffee in the logo is the old-but-new script typography that replaces the chunky, rounded typography that has become synonymous with Dunkin’ Donuts. I’m a fan of vintage script typography, but I’m not sure this was the right move as the loss of visual impact is far less worthy than some blast from the past. 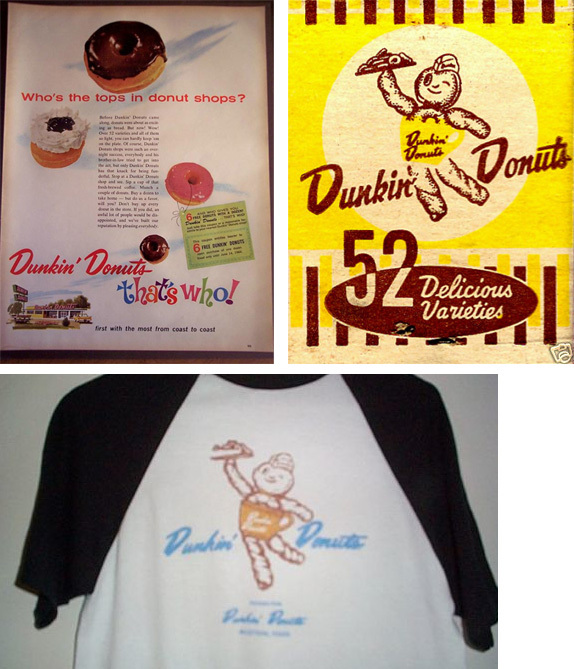 Nonetheless, it does look great on a t-shirt — and said t-shirt also brings back some vintage Dunkin’ana with the tag line “Time to Make Donuts” made popular by Fred the Baker, who served as their spokesperson from 1982 to 1997. The in-house team took Steven’s Dunkie torso to revise their current 60th anniversary logo, which was fine but, now in tune, with the new identity is fare more interesting. 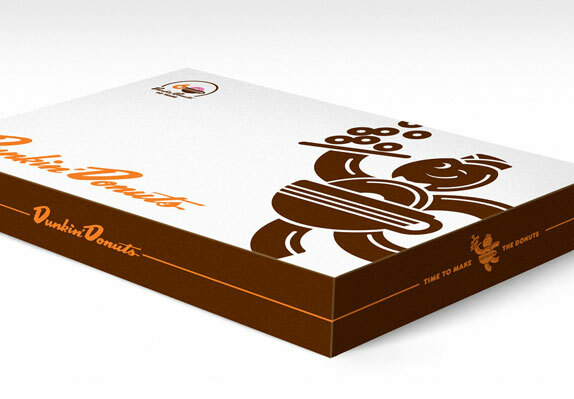 The folks at Dunkin’ Donuts have also been busy with some new packaging prototypes that include Dunkie and the new script, and it’s nice to see that the logo is not applied as the same lock-up over and over again. Lastly, some rather cool merchandise has been created with the new look and I have to say that, unlike its golden-arched competitor, I’m Lovin’ It. 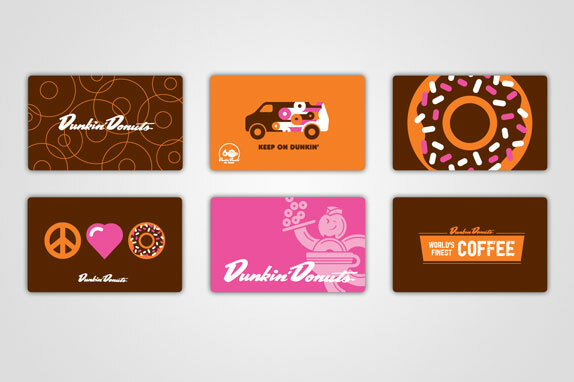 Thanks to Oliver Gallart, creative director at Dunkin’ Brands Inc., for the images. With nearly 9,000 stores worldwide, more than 6,000 of them in the United States alone, serving 2.5 million donuts and 2 million cups of coffee to more than 3 million customers per day, Dunkin' Donuts is undeniably one of the most prominent guilty pleasures in the world. I favor Starbucks coffee and de-favor eating donuts altogether (despite their awesome deliciousness) so I'm in a minority that doesn't frequent Dunkin' Donuts — a minority that has become even smaller since 2002, when a steaming cup of coffee was added to the Dunkin' Donuts logo to muscle back into consumers' consciousness that coffee wasn't just available from Starbucks or McDonald's. And, apparently, that change paid off as Dunkin' Donuts is celebrating its 60th anniversary (it was founded in 1950) with a new identity that not only removes the coffee cup but also reaches back to its vintage roots for inspiration.